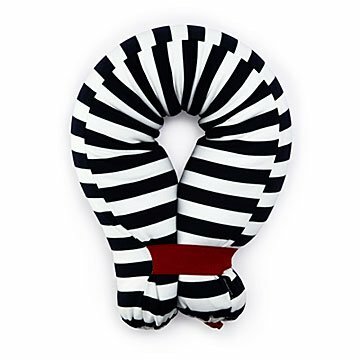 This flexible pillow offers comfort and support to your aching back in any position. It's easy to overlook how much hard work your back and neck are doing until they start to ache. That's why this flexible, multi-talented pillow—designed by a physiotherapist—is here to offer some support. Put it behind your back for lumbar support at the computer, or stretch it out to go under your neck as it straightens your posture in bed. Wrap it over your shoulders for a nap while traveling, or drape it over your lap to help hold a newborn baby in your arms. The pillowcase is machine washable, and the microbead filler provides a flexible-but-firm cushion in any position. Made in China. Machine wash pillowcase cold. Pillow, spot clean.